Nitin Sawhney is Assistant Professor of Media Studies at The New School. He engages technology, civic media, and artistic interventions in contested spaces, examining social movements and crisis contexts through creative urban tactics, participatory research, performance, and documentary film. NITIN SAWHNEY is Assistant Professor of Media Studies at The New School. His research, teaching and creative practice engages the critical role of technology, civic media, and artistic interventions in contested spaces. He examines social movements and crisis contexts through forms of creative urban tactics, participatory research, performance, and documentary film. Nitin completed his Ph.D. at the MIT Media Laboratory in 2003 and taught at the MIT Program in Art, Culture and Technology. He was awarded a Visionary Fellowship at MIT for the Jerusalem 2050 Project in 2008. Nitin has conducted digital storytelling initiatives with Palestinian youth in refugee camps since 2006 and co-directed the award-winning documentary film Flying Paper, co-produced with children in Gaza from 2011-2013 with support from National Geographic. He established the Engage Media Lab at The New School to support participatory media programs and research with youth in Jerusalem and New York. In 2011-12, Nitin led OccupyDataNYC, a series of hackathons and exhibitions visualizing socio-political data and tactics of urban protest, conducted with activists and researchers at The New School, NYU, and CUNY. 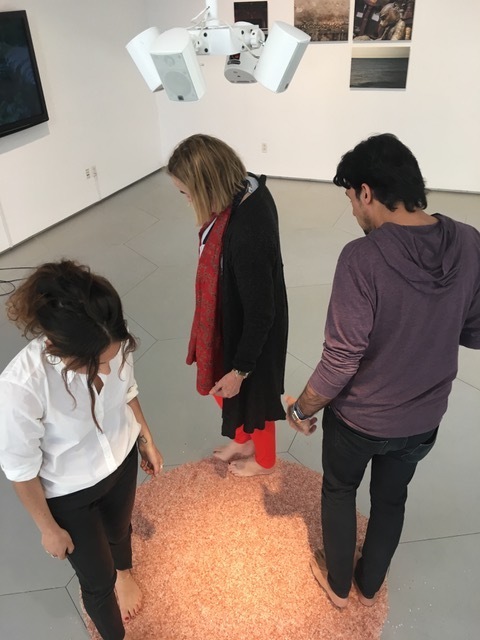 In 2014-15, he established Guatemala Después, a curatorial research project examining contemporary artistic practices with collaborative exhibitions in Guatemala and New York. He also co-directed the documentary film, Zona Intervenida, examining historic memory through site-specific performance interventions in Guatemala. In 2016-2017, he devised Sacred Soundwalks, a sensory media project and sound installation exploring narrative memory of “sacred sites” in Kathmandu, Nepal and along historic pilgrimage routes to Mt. Kailash in Tibet. In June 2018, he presented research on Audio Journaling for Self-Reflection and Participatory Assessment among Teens at the International Conference on Interaction Design and Children in Trondheim, Norway, and is preparing a book chapter “Palestinian Children under Siege in Gaza” for Children, Youth and War, to be published by University of Georgia Press. See more of his work at http://www.NitinSawhney.org.